Early configurations of comparison microscopes consisted of a matched pair of compound microscopes with conventional specimen stages. These stages were joined by a system of lenses, prisms, and mirrors in what was termed an optical bridge. 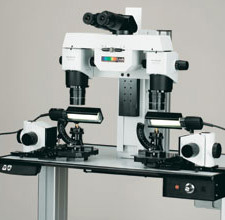 The bridge allowed the scientist to observe and compare two physically separated but optically joined objects simultaneously in a single field of view. This field of view was split by an optical hairline. However, the specimen stages of these early comparison microscopes were not configured for forensic firearms examinations and in fact predated the field of firearms identification by nearly two decades. preparation of exhibits based on the photographs. The evidence items were examined in sequence, not simultaneously. The evidence items could only be simultaneously compared using photographic prints. The photographs taken were two-dimensional representations of three-dimensional objects. Early in 1925, Colonel Calvin Goddard (generally acknowledged as the father of firearms identification in the United States) and his associate, Phillip O. Gravelle, (microscopist, tool designer, and photographer) adapted the existing compound microscope to accommodate simultaneous microscopic forensic bullet comparisons. They achieved this by using an optical bridge to join together the stages of two compound microscopes. This basic monocular instrument has evolved considerably over the past eighty years into the sophisticated instruments used today.